Chocolate has always been special. 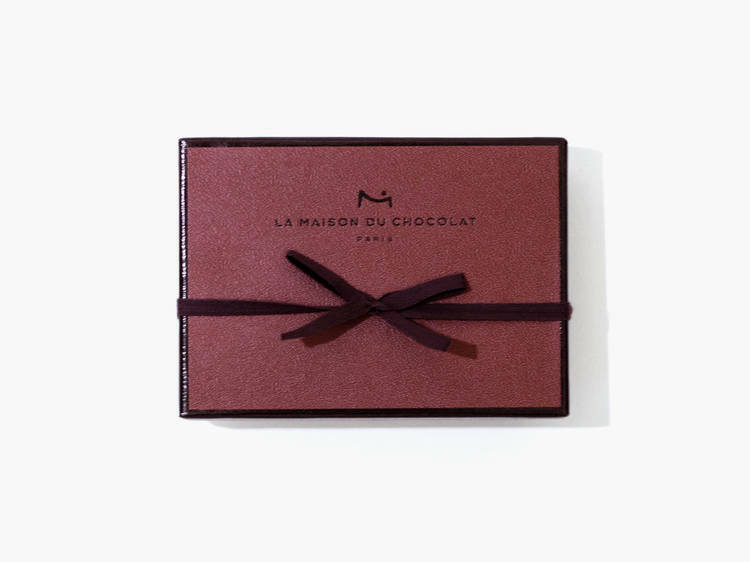 And La Maison du Chocolate lets you immerse yourself in that feeling, right here in Tokyo. In 1977, Robert Linxe¸ who would later become known as the “sorcerer of ganache,” opened the first location in Paris. The atmosphere at the time of the store’s opening is described in detail by culinary expert Asako Kishi, who has also served as a judge on the famous Japanese food program “Iron Chef. When you think of famous chocolateries which rewrote the entire history of French chocolate, which caused an evolution, you think of La Maison du Chocolat, founded in Paris in 1977.
he chocolates he makes, overflowing with the sweet scent of cacao, soon became the talk of Paris, and caused a boom that would completely captivate the Parisians. Even now, 40 years later, each piece is a little taste of heaven. They earn the title “sorcerer of ganache” with a deep melt-in-your-mouth texture and a creamy mellow taste. In contrast to the recent “bean to bar” boom, characterized by chocolates which aim to perfect the cacao’s own flavor as an ingredient, this chocolate perfects technique. They craft their chocolates with talent, passion, attention to detail, and an enterprising spirit. Everything, from breaking up the couverture to cutting, coating, decoration, and even packaging, is done by hand. All the chocolates are handmade onsite using that morning’s milk, for the same fresh flavor you would find in their homeland. And it’s not just the taste—just as “The Tokyo Chocolate Book” mentioned above, the attention to beautiful packaging and design can’t be ignored. These chocolates make a good reward for yourself, or a gift for someone else. You can tell from the appearance and the packaging how exquisitely made they are, and when you put one in your mouth you feel an intense happiness. (…) I often give them as a birthday gift, or just stop by the store in Roppongi for a piece or two on days when I’m really feeling exhausted. In the past few decades, all chocolate cheap and expensive has grown closer to us. But a single piece of carefully crafted chocolate will always be a special thing which makes our hearts dance with joy. These chocolates are every bit as dazzling as they were 40 years ago—try one and see for yourself. Last updated on July 21, 2018. The information on this page may not reflect the current trends.